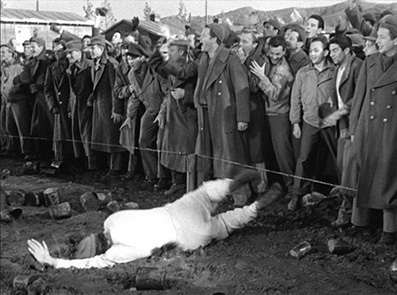 Billy Wilder's STALAG 17 takes an irreverent look at what must have been a fresh horror in 1953, German prisoner-of-war camps. 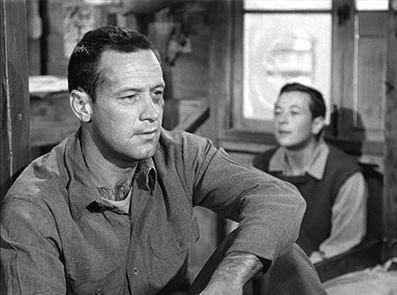 With an Oscar winning turn, William Holden shines in a movie juggling drama and humour. Camus braves the barbed wire. "...the trend in Hollywood is toward the hand-wrought, individually-produced pictures. Pictures should be made in their own national spirit, traditions and color. If each has the universal quality of truth, vivid emotion and direct aesthetic experience, one can expect the film to be successful anywhere in the world." So my friend and I stayed up one night to see it. The film underwhelmed us, the humour broad and utterly unrealistic (my introduction to historical context I suppose). So we sat it out and waited for the 'funniest line in cinema'. Once Jack Lemon takes off his wig and announces to Joe E. Long "I'm a man," Long's reply is forever etched in my memory but for all the wrong reasons. The line (incidentally a placeholder until the writers could come up with something better – they couldn't) "Well, nobody's perfect!" became our code phrase for something and anything that simply did not deliver on expectations. 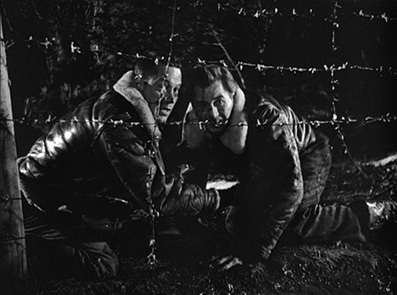 Stalag 17, made in 1953, features characters that act in an almost painfully self-conscious 'funny' manner and it's decidedly unfunny to watch them. As I said, Holden's J.J. Sefton (comparable to the character of the spiv Walker in the BBC's Dad's Army) comes across as the only 'real' character in the barracks. Everyone else is twisted and off just that little bit. There seems to be a playful, nationalistic virus to which only Holden is immune. All the other characters act as if being a prisoner of war in Germany during 1944 was a bizarre theatre to endure, a knockabout farce in which no spirit goes unbroken and no real violence or death ever really hits home. Two escapees are gunned down within the first ten minutes of the movie. The only real reaction from their barrack mates is frustration that the Germans knew to wait for the hapless souls to wander straight into a machine gun shaped trap. Later in the film, two of the worst offenders 'paint' their way out of the camp to say hullo to the girls of the neighbouring camp in the shower queue. They end up whitewashing a German guard in the face and his reaction is beyond pure farce and he adds a pratfall in the mud just in case the humour wasn't broad enough. I was convinced that René from Allo Allo would wander in from the wings. The plot is fairly straightforward. After the fatally unlucky prisoners are gunned down, the members of the American barracks all intuit that one of their own must be an informant. The obvious candidate is the man who stays away from the group and acts selfishly doing deals for all sorts of desired material items with the German guards. He protests his innocence but he is too universally mistrusted to sway the crowd. The main characters in the barracks assert their personalities some not too successfully (but what the hell do I know? As mentioned earlier, the worst offender for me got an Academy Award nomination for his role). There's the double act of Stanislas 'Animal' Kuzawa and Harry 'Sugar Lips' Shapiro (Robert Strauss and Harvey Lembeck respectively). The former mugs his way through a role that must have been set up as the comic relief and the problem with this is that he knows it. It's that awkward Jim Carrey syndrome – 'Just look how bloody amusing I'm being!' which results in this particular audience member turning right off. The banter between the two is relatively solid but when Animal acts like a dumb idiot, prat falling unconvincingly over a low barbed wire fence to pretend to get to the Russian women (what's he going to do, wine and dine them?) in front of a machine gun tower, I had a very naughty wish. With ice-cold command (something he was probably used to as a director himself) is Otto Preminger playing Colonel von Scherbach. Even bootless, the man has gravitas by the bushel. Marx Brothers favourite Sig Ruman plays Sergeant Schultz, a theatrical buffoon conforming to every German officer cliché in the book that by then, in his defence, probably hadn't been written. But having said that, Rumen was a few chapters in already. The 'Allo Allo' level of characterization and humour does not sit well with what was known then about the reality of concentration camps. There was still that uneasy truce between prisoner and guard to be exploited by some and constantly resisted by others. Determined to deliver justice to the perceived informant, Duke (Neville Brand) can find no other candidate and with his lead, delivers a sound beating to Holden together with the rest of the men. Though brief, this has echoes of Private Pyle's (Vincent D'Onofrio's) treatment in Full Metal Jacket. We know of course that Holden is not the culprit. Once a new and important prisoner is dragged out to be tortured, the men rally to rescue him and affect an escape. In among the effectively staged suspense and intrigue, there are notable moments, not all to my taste however. Acting on his prejudices, Duke savagely throws a copy of Mein Kampf at Holden which so narrowly misses him as he shaves, it seemed like a special effect. Holden doesn't even blink. And yes, I have looked for hidden wires. A new prisoner (Bagradian played by Jay Lawrence) is a dab hand at impersonating famous actors of the day. Regardless of how good he is, the movie tends to stop dead until he's finished one of his shticks. I was pleasantly surprised to hear my view echoed by one of the three men in the commentary who said after the Cagney impression "That's a little forced..." William Pierson as Marko the mailman has an astonishingly grating nasal voice. This may have passed as intrinsically funny in 1953. The repetition of "At ease!" shouted by Marko to calm everyone down and then its further repetition by Animal drove me slowly around the bend. I felt like the German dinner guest in Fawlty Towers... "This is not funny!" And we are invited to believe that Animal was in such a state of misery or insanity caused by finding out the fantasy love of his life, Betty Grable, had got married that he would then imagine his friend as Betty and dance with her/him in a faux-romantic stupor. The internet seems to pulse with appreciation of the humour of these hilarious antics. I can't see it. The famous afore mentioned scene of Animal and Sugar Lips painting a white line to exit the camp and get an eyeful of the Russian girls showering is almost gold plated as a classic comedy scene on various appreciative web sites. It's the Some Like It Hot syndrome for me, a gaping and alarming deficiency on my part, granted, but this stuff doesn't seem to be aimed at a 2015 funny bone. How could it be? I imagine the unconditional love for this film comes from those who saw it in context when the world could laugh at simpler demonstrations of buffoonery. Taking the dated (or indeed universally unfunny – take your pick) scenes and antics away from the movie and you still have a strong drama with a solid leading man and enough tension and suspense to draw you in. The movie asks us to believe that in a prisoner-of-war camp, a man is being hidden so well that no German guard can find him. I'll admit, like the piano in Casablanca, where the letters of transit are sequestered, the man's hiding place is well chosen. 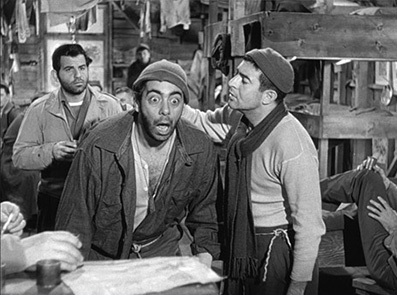 So without wanting to put you off, I would still recommend Stalag 17 with the simple proviso that if you've heard it was a comedy, be prepared to either stretch the definition of comedy or dismiss it altogether. This is a solid drama with one stand out performance and plenty of thrills and suspense to be entertained by. The 1.37:1 original aspect ratio looks damn fine. Contrast is spot on and grain hardly noticeable. There is precious little evident damage. There's not a great deal of tonal range throughout the movie as there aren't many moments of brightness in the narrative let alone the cinematography but when we do see a searchlight, the film doesn't bleach out. We rarely get a clean close up but even in the mid shot, the level of skin and fabric detail is terrific. On the darker shots with a good deal of black in frame, it's always good news not to be able to tell the screen-black from the vertical right and left borders. There are optional English subtitles for the deaf and hard-of-hearing and the PCM encoded soundtrack is perfectly fine. No line is left behind. That said, there is very little music in the film (Franz Waxman is credited as the composer but hey, that must have been a relatively easy gig). "When Johnny Comes Marching Home" could not have tested this celebrated movie composer's talent too hard. As in the Blu-ray of Ace In The Hole, Sinyard has been shot in his office and again, the bleached out part of his head due to sunlight pouring in from the left makes me think this was shot in a hurry by a camera team that may not have had all the experience (or gels) in the world. Never mind. Sinyard is a fine scholar on Wilder and the detail packed into the twenty-four minutes is well worth the viewing. I was happy to see that Sinyard's jumper of choice had been changed. In his previous piece on the Ace disk, it was almost an Extra Feature in itself. Wilder aficionados (and you can't go too far without encountering one of those) wax lyrical about the 'Viennese Pixie'... It's also nice to see the faces of three men (two actors and a playwright) who take up the commentary duties. Survivors from the real camps talk about their experiences. It is remarkable how faithful the movie's details are given the cine film and stills on offer in this extra. The archive material is very affecting. You may be somewhat removed from a distant plane crash but when those flimsy fighting birds hit the ground in a fireball, there's no doubting that you are watching men die. The stories of the men's eventual liberation are terribly moving but I do wish the composer was given a different brief. The more affecting the drama, the less the need to underline it with music on Syrup level, nine point nine. For the first five minutes, I was a little concerned how this commentary would develop. There was no guarantee that the participants had ever met before and each had to be in their 80s (not meant as derogatory but things move a tad slower the older you get). Add to this, you don't get the impression the men knew what was required of them. As their names come up in the front credits, each does a little cheer. When seen on screen, the semi-ironic self-deprecating remarks come along. For a moment there I thought this commentary was going to be listening to three men watch television. And then something rather lovely happens. All three find common ground (all have war stories) and all have lovely memories of classic Hollywood. There are precious few scene specific remarks (one of them humourously complains that another just talked over his main scene). They all have good words for William Holden acknowledging his overt alcoholism (his assistant apparently delivering a daily vodka before work) but also his decency and good nature. When we get to the volleyball scene, there's a little dissent (which is at the very least refreshing). "This is a scene I don't like... It's overdone." one says Maybe he's overdoing the cultural stereotype of the unfunny German, but the man has a point. They all love Animal's antics (Robert Strauss), which is where they and I diverge in opinion. There are many longeurs when the men are clearly enjoying just watching the movie and I can forgive this. It's nice to hear some dissenting views and there are very few interjections in the last thirty minutes but the commentary does end with a line worth quoting; "Whether we like it or not, it's a classic!" Not available for review but I can't see Masters of Cinema dropping the ball on this inclusion. The accompanying booklet has never been less than hugely informative and packed with rarely seen production photos. I can't see this one being any different. 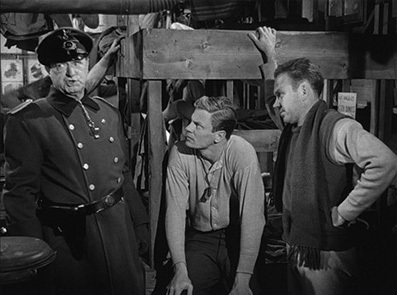 Stalag 17 is an acknowledged Wilder classic, granted, which contains elements that may not sit as pretty today as they did just after the war, the subject of its situation, characters and comedy. Some broad humour may indeed be era-dependent. I'm not sure 2015 audiences will swallow what passes for funny in Wilder's movie but there's more than enough to make up for that shortcoming in an otherwise solid concentration camp drama. This is for Wilder purists, of course and anyone who enjoys effective drama.